The recent film Noah, directed and co-written by Darren Aranofsky, can help elucidate what exactly it means to be made in God’s image and so to rule over creatures, particularly since the treatment—and maltreatment—of creation is one of its major themes. Two different ways of having dominion over the world are presented in the work: the way of Noah and his family, who use the goods of nature with respect, and the way of the sons of Cain who exploit not only nature, but also one another. In this regard, the most fascinating character of the film was Tubal-Cain, presented as the leader of the wicked descendants of Cain who try to take Noah’s ark by force. Tubal-Cain is mentioned in Genesis 4:22 as the first person to forge tools out of metal; in the film, not only do these tools include weapons, but the metals are raped from the earth with particular disregard for the surrounding environment. Now, a less competent screenwriter would have turned Tubal-Cain into a disbeliever in the God of Noah and a sceptic about the impending deluge. In this film, however, Tubal-Cain certainly believes in the same Creator as Noah and never questions the prophecy of a flood. For Tubal-Cain, the question is not whether a flood will come, but rather who ought to be saved from it. Significantly, Tubal-Cain refers a couple of times in the film to the verses of Genesis 1 cited above. He asks God why, if he is made in his image, God wants to destroy him and humanity. Later, in a longer conversation he has with Ham, Noah’s middle son, Tubal-Cain explains that because God made man in his image, man has dominion over the earth and ought to do what he wants with it. To be a man, he explains, is to assert one’s will: to kill and to subdue. This is the vision of man made in God’s image that is presented against Noah’s vision. Such a vision is particularly relevant today, because Tubal-Cain represents the Nietzschean aspect of our own culture. For Nietzsche, the most important thing in life is exercising one’s autonomy. Though it need not necessarily be through violence—Nietzsche does respect mercy and magnanimity, contrary to some caricatures of his philosophy—the will to power does involve a person coming up with his own rules even when that involves clashing with others. Now, if this view of man is correct—if being made in the image of God, to drift back to Tubal-Cain’s language, means becoming an autonomous agent and imposing one’s will—then the meaning of ruling over the creatures of the earth takes on frightening proportions. There are some very disturbing scenes in Noah in which we see the desolation wreaked on the land by cities and mines, as well as the slavery and cannibalism practised by the wicked. The sons of Cain assert their control over everything and impose their strength on all that is about them. Chaos and suffering is the result. The corrective, of course, is Noah’s anthropology. For Noah, being an image of God means something quite different. It means trying to discern the will of the God of whom he is the image. It means honouring other human beings—other images of God—that surround him. It means ruling over creatures in a way that respects their inherent goodness and glorifies God. None of these things, I should add, comes easily to Noah in this film’s interpretation, for he must deeply struggle to find out exactly what it means to rule over his family and over creation with justice. 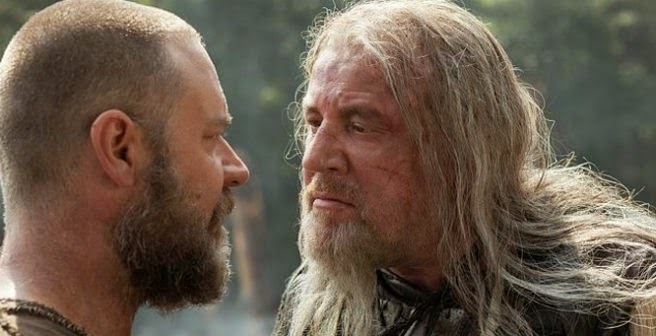 (In many ways, this film places Noah alongside the other great prophets and patriarchs like Abraham and Jeremiah who had similar painful discernments.) Truly being an image of God does not mean striving for autonomy, but rather striving for communion with God and his creation. One of the reasons, that the introduction of Tubal-Cain’s world-view into the story is so effective, is that it reveals the distorting lie upon which evil is based. Tubal-Cain believes in the Creator and believes that he is made in the Creator’s image. But he twists this truth into a lie, making personal autonomy the most important thing, and in so doing unleashes wickedness. In doing so, he is not alone. Many moral evils in the world stem from a lie about what man is. To figure out where a destructive ideology goes wrong, the best place to begin is usually with its anthropology. I have heard mixed reviews on the Noah film. I think that a kind of eisegesis seems to run rampant in analysis and even representation of Noah or any biblical film. I thought this review from the Guardian was pretty good on characterizing Noah and taking the biblical text seriously without glossing over the problematic aspects. There are so many absences in the story of the Flood. The greatest of them is Noah himself. From the moment God speaks to him until he leaves the ark and steps on to dry land, he never says a word. Most importantly, he does not reply when God tells him that he is going to destroy all living creatures except Noah and his family. Noah expresses no shock or horror at the idea of the mass destruction of the Earth and its inhabitants. Nor does he plead with God to think again, to give human and animal kind another chance. Even Abraham, that apparently super-obedient servant of God, who seems not to demur when commanded to kill his own son, even he stands up to God at the prospect of the destruction of Sodom. "That be far from thee to do after this manner, to slay the righteous with the wicked … and that the righteous should be as the wicked, that be far from thee: Shall not the Judge of all the earth do right?" Abraham, so painfully obedient, dares to confront God and teach him a lesson in equity and justice. Noah is no hero, not chosen for his specialness. He walks "beside" God, whereas Abraham is permitted to walk actively "before" him, a doer in the world. Noah is apathetic, lacks vivacity, yet God, in choosing him, shows an irrationality we have seen before in Genesis (favouring Abel's offering over Cain's and setting up the first motive for murder, for example). Perhaps, at best, he is chosen for his blankness, for being all potential.